Provincetown for Women is delighted to welcome Kim Baker, author of Girls’ Guide to Healthy Dating: Between the Breakup and the Next U-Haul. 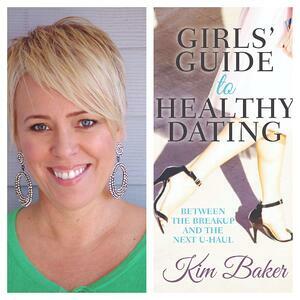 Kim will be hosting a talk this Single Women’s Weekend about the four pillars of healthy dating. Come meet women, share your dating horror stories, and learn how you can have a more empowered dating experience. Where: Cabaret at the Crown & Anchor, 247 Commercial St.
Provincetown for Women spoke with Kim about how she ended up writing a lesbian dating advice book, her top takeaways, and what you can expect from her talk. Provincetown for Women: How did you end up writing a lesbian dating advice book? Kin Baker: I had just gotten out of a long-term relationship, and realized that I had gone from relationship to relationship and I didn’t really know how to date. And I realized that if I wanted to have a different experience in relationships, then I needed to date differently. But I had no idea where to start. So I started looking around for lesbian dating books, and at the time – this was around 2010 – there weren’t any. I couldn’t find any books on how to date in a healthy way as a lesbian. And you know what they say: If you want to read a book and you can’t find it, then write it. So I set out to experiment with doing things differently in my own dating life, and then a few years after that, I sat down and wrote a book about it. And that’s how it came to be. PFW: What do you think it is about the lesbian experience specifically that makes us so likely to jump into things so fast? KB: We’re all women, right? And women are conditioned to connect. It’s our biological purpose on this earth, to connect with each other emotionally and physically. So when you’re talking about two women, you start dating someone and you like them and you’re like, well why not see if this’ll work? So for me, it became about making all these relationships work instead of really evaluating compatibility and looking for the things I really needed in a partner. I don’t know if everyone does this, but I definitely spent most of my dating time digging in and going, Alright, we’re together, we’ve known each other a few weeks, and how are we going to make this work? PFW: What other common mistakes did you identify in the lesbian dating community? KB: One of the big ones is that we like to date our friends. We date people before we’re over our exes. We date our ex’s exes. There’s this weird thing in our community where the circle of who we date doesn’t expand very far. And that habit can keep us in some patterns. PFW: In the book you cover the importance of focusing on yourself rather than others. Isn’t the point of dating to focus on someone else? KB: I suppose that’s one way to look at it. But when I talk about focusing on yourself, I’m really talking about how we approach being healthy in relationships. I think we all tend to get very outwardly focused. We have blame the other person for whatever we’re experiencing in a relationship, and we don’t really examine what our own part is in that situation. So then when the relationship ends, or if we have another similar situation, the pattern just repeats itself because we’ve done no examination of what our responsibility is. So when I talk about focusing on yourself, I’m really referring to approaching dating from a position of self-responsibility. When you’re in a relationship, you’re a team, and you’re very focused on each other in a healthy, interdependent way. But in a lot of cases, we get lost because we lose ourselves. We lose our habits and our hobbies and our voice, and we get overly focused on the relationship. Nothing will ruin a relationship faster than abandoning ourselves. PFW: I don’t want you to give any spoilers, but what are some common things women could do better with online dating? KB: One thing that I learned is that the online dating profile is really crucial. We think that we have to impress everyone, so we try to stick to only things that make us look good. And there’s nothing wrong with that, but what tends to happen is that we don’t let who we really are come through fully. The best profiles are the ones where girls let their quirky side shine through. PFW: What’s one piece of advice to you have for women who are coming out of a relationship or are struggling to get back out there? KB: The number one thing that changes everything is healing past grief. I don’t actually talk about this very much in the book, but we live in a pretty grief-illiterate society. We don’t really know how to comfort each other through periods of grief, and we don’t process it. So it gets stuck, and it piles up. When you jump from relationship to relationship, you just carry all that old stuff right into the next one. It really blocks us from being present and vulnerable and authentic, and you need those three things to make deep emotional connections. Processing that grief looks different for everyone. For me, I had to first acknowledge that I had grief. When we’re not aware that we’re carrying grief, it can control us in ways we don’t realize. So the first thing is to acknowledge the places where we need to do some healing. And then once you figure out where that grief is coming from, you really just have to do some grief work. I went through an old-school book on healing grief, and it was amazing how fast I began to feel lighter. I think it’s because I finally let myself acknowledge that there was some old stuff that was stuck and always running in the background. PFW: What can people expect from your talk at Single Women’s Weekend? KB: They can expect a fairly casual conversation. A lot of times when you get back into the dating scene it can feel like, “Ugh, here I go again!” It can be very daunting. So I’ll provide specific strategies to have a more empowered dating experience, and four key components of dating that we can do differently. Because the only thing we can really control is ourselves. So if nothing else, people can come, hear some funny stories, and talk about dating and relationships. And I have some giveaways, so you might just get a free book out of it! Once again, you can find Kim at 11:15 on Saturday, May 19 at Cabaret at the Crown & Anchor, 247 Commercial St. Kim will be joining us again at 2 PM at the Harbor Lounge (359 Commercial St), along with three other lesbian authors, to talk dating, lifestyle and romance. Learn more about her work here.